Two young women, dormitory mates, embark on their education at a big state university. Five years later, one is earning a good salary at a prestigious accounting firm. With no loans to repay, she lives in a fashionable apartment with her fiancé. The other woman, saddled with burdensome debt and a low GPA, is still struggling to finish her degree in tourism. 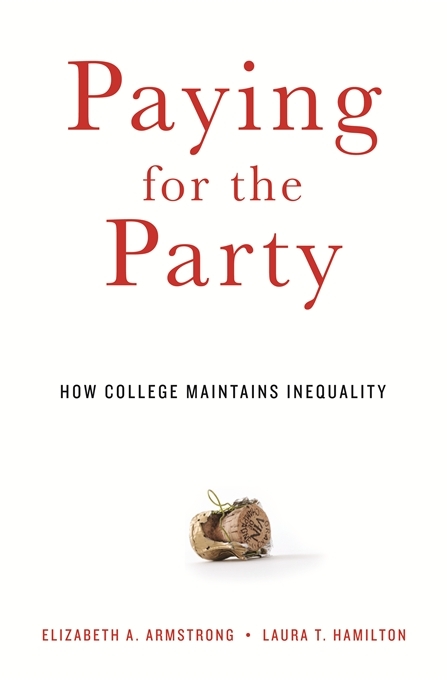 In an era of skyrocketing tuition and mounting concern over whether college is “worth it,” Paying for the Party is an indispensable contribution to the dialogue assessing the state of American higher education. A powerful exposé of unmet obligations and misplaced priorities, it explains in vivid detail why so many leave college with so little to show for it. Drawing on findings from a five-year interview study, Elizabeth Armstrong and Laura Hamilton bring us to the campus of “MU,” a flagship Midwestern public university, where we follow a group of women drawn into a culture of status seeking and sororities. Mapping different pathways available to MU students, the authors demonstrate that the most well-resourced and seductive route is a “party pathway” anchored in the Greek system and facilitated by the administration. This pathway exerts influence over the academic and social experiences of all students, and while it benefits the affluent and well-connected, Armstrong and Hamilton make clear how it seriously disadvantages the majority. 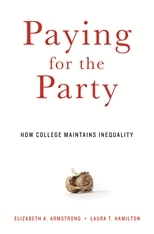 Eye-opening and provocative, Paying for the Party reveals how outcomes can differ so dramatically for those whom universities enroll.